In recent years increasingly more schools have actually been endeavoring to enhance their protection. Safety in our schools is a significant worry in regional communities, and unfortunately, their trepidation is warranted. The world, in general, is not a tremendously trustworthy place. While there is, of course, a lot right with the world, it’s what’s wrong with it that we need to worry about. School safety is a great place to start. With an increase in shootings, jihadists, pedophiles, mentally deranged students & adults, and heaven knows what else, today’s parents have plenty to be concerned about when sending their children into the care of our school system. There have been over 254 school shootings in our country since 2013, not including suicide attempts using a gun on school grounds. That rounds out to approximately one shooting a week. As a result, it’s no surprise that a solution to the school safety issue is being urgently sought. Security cameras are sometimes useful for deterring crime, however when a perpetrator has decided to take some drastic action, like brandishing a gun at school or running someone down in the parking lot, it’s assumed knowing a camera is present isn’t slowing them down much. After the act has been committed, we can use our security camera footage as evidence, but something more must be done to protect the students. In the past, especially in active shooter situations, students were taught to hide in the classroom they were in when the threat was realized, lock the door, shut off the lights and wait for instructions from a school authority. This school safety strategy has been met with mixed reviews. Since a school shooter is probably wanting to shoot kids in school, locking them down may not be the best strategy. 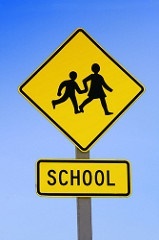 Today, school children of all ages are taught to evacuate the school if at all possible. If that option isn’t viable, then hide, but fight back if the perpetrator finds them. Many schools are using an access control system on their available entrances as a manner of daily security. You may have even seen the keypad on the front door of your child’s school, or need to speak to someone via a speaker to obtain access to the school. The system requires a code be entered on the access point control panel, or to speak with someone through the intercom, to gain access to the school. They are supplemented by video display, showing the school official who is requesting entry, and allows for conversation regarding their need to visit. An effective deterrent, the system can be expanded to include multiple access points as well as classroom locks, all optionally using keypads, card readers, facial recognition, or fingerprint scanners. There is a customizable system to suit the needs of any school district, no matter the level of security required to ensure school safety at your school. Granted, using the access control system isn’t going to completely bar entrance to any crazy person determined to get into the school to wreak havoc. What it will do is slow them down, offering a valuable window of opportunity for students to escape the threat. Especially when used in combination with security cameras, authorities are able to track the intruder and direct students away from danger. 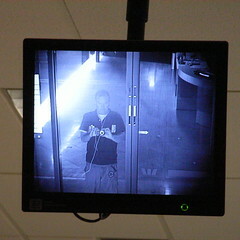 Security cameras are also extremely useful in monitoring behavior, not only of students, but of teachers as well. Those potentially committing crimes against the students, whether it be abusive treatment or some form of sexual perversion, are highly motivated to modify their behavior with the presence of security cameras. Worst case, they will provide evidence supporting any disciplinary actions. The safety of our children in our schools is a valid concern worth the investment it will take to protect them. Onguard personnel have the expertise to help you determine the most cost effective solution for your particular school safety needs. They can install your system and provide instruction on how best to utilize its features. Call Onguard for any of your security needs. They have the latest technology available at a reasonable cost.